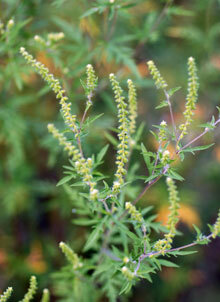 Also Called: Short ragweed, annual ragweed. Stems: Erect, branching above, rough, variously hairy with long spreading and/or shorter, appressed hairs. Leaves: Opposite lower leaves, alternate upper leaves; stalks .4 to 1.2 inches long; ovate or elliptic in outline, 1.4 to 4 inches long, to 2.8 inches wide; once or twice deeply pinnately-divided; ultimate lobes lanceolate to narrowly oblong; margins entire or few-toothed; surfaces pubescent, gland dotted; undersurface often with longer hairs along main veins; upper leaves less divided, nearly sessile. Inflorescences: Monoecious (staminate and pistillate heads occur at different locations on same plant); heads of staminate florets on short stalks in spike-like racemes, terminal; heads of pistillate florets in clusters in leaf axils below staminate inflorescences. Flowers: Greenish-yellow; staminate heads shallowly saucer-shaped, 1/12 to 1/6 inch wide; florets 12-20+; pistillate heads egg-shaped, 1/8 inch long, 1-flowered, pubescent or nearly glabrous. Fruits: Bur-like, egg-shaped, 1/8 to 1/5 inch long, hard, formed by floral bracts; beak 1/25 to 1/12 inch long, surrounded by 5-7 short blunt spine-like projections; seed 1, small. Habitat: Disturbed sites, roadsides, waste areas, prairies, pastures, stream banks, pond and lake margins, old fields, fallow fields; wet to dry soils. Toxicity: Accumulates nitrates but is rarely consumed in large enough quantities to cause poisoning. Will cause digestive upset in cattle. May cause skin irritation due to volatile oils. Forage Value: Very limited forage value for livestock due to low palatability. Upland game birds, wild turkeys, songbirds, and small mammals will eat the fruits. Uses: Native Americans steeped the leaves and took the tea for fevers, pneumonia, and to stop vomiting and used it as a wash for hives and swellings. They applied the crushed leaves to insect bites and used the plant for toilet paper. Comments: Common ragweed is wind pollinated and is a major cause of allergies in late summer and early fall. It is a variable species.